DeelaSees: Arts & Letters Commencement! After a long weekend and an even longer 4 years, today finally came. The day that would end it all. 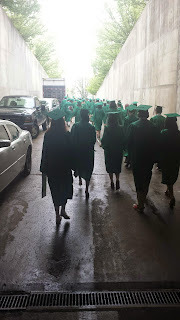 Early this morning, I, my family, and hundreds of other graduates and guests made our way to the Breslin Center for what was my third commencement ceremony, that of the College of Arts and Letters. 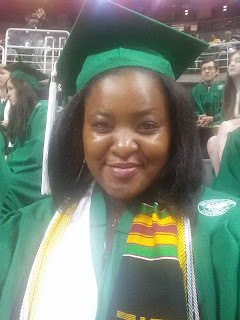 Today was the day that my Bachelor of Arts (B.A.) in French was conferred upon me. The senior address was given by a kid named Simon F. Zagata, and it was absolutely brilliant. He cheekily likened coming to MSU to making the worst dating decision ever; for all the hard work, trials, and sleeplessness it'll take to maintain the relationship, you already know going in that it won't last but four or five years. But in essence, that's where the joy of the experience comes from. He ended his address by encouraging us to be passionate, take chances, and not be afraid to fail and then get back up with a smile to try again (and I paraphrase): "Because no one's ever inspired when it all goes right the first time. And as Spartans, I don't think we'd have it any other way." Once we'd switched our tassels to the left and been congratulated by the dean of the college, the MSU Symphony Band played "Pomp and Circumstance" to accompany the faculty as they proceeded out of the Arena. But as soon as they were out of sight, the symphony started up the Michigan State University Fight Song, and all of us newly-appointed Spartan alumni jumped up and sang along together! Believe it or not, this was my first time ever singing the fight song at a public MSU event. 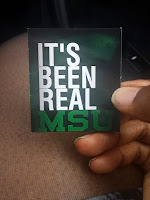 Yes indeed, in all of my four years living on MSU's campus (one year I even lived kitty-corner to Spartan Stadium), I never once went to a single a sporting event. Not even during the often-worshipped football and basketball seasons. 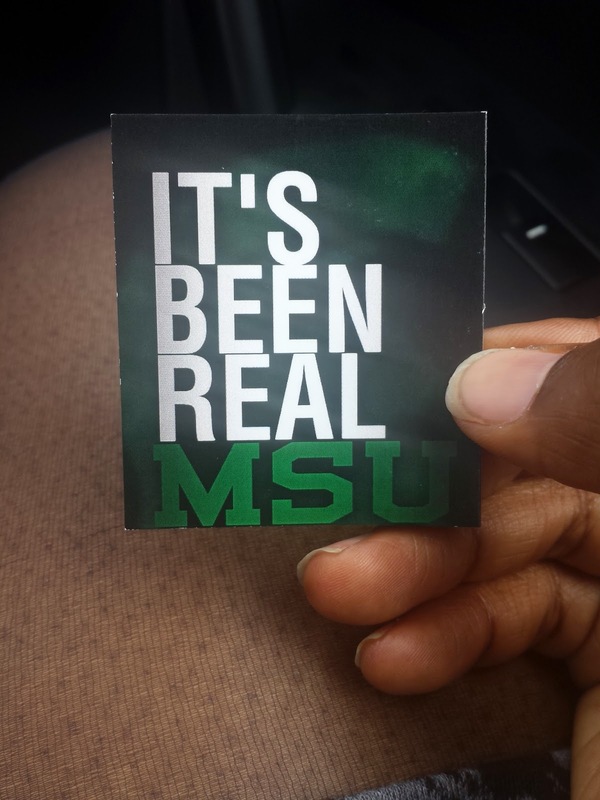 To be honest I've just never been very interested in sports, and witnessing MSU's particular flavor of sports cult firsthand semester after semester certainly didn't make me any more eager to join the fandom. So I don't regret not attending any sports events while at State. With that said, I'd be lying if I didn't admit how mightily gratifying it felt to have one last chance to shout along to "On the banks of the Red Cedar...!" with 400 of my fellow Spartans. It was the perfect ending to an era, that era being my life as a student. My relatives who'd stayed from yesterday posed with me for a few pictures, but they had to jet off to start on their long drives back to Kentucky. Then I treated Ma to lunch, because today is also Mother's Day! Now we're back at home. After three days of back-to-back graduation fervor and festivities, I'm relieved that it's over but also a little deflated. Now that I'm free, I can literally do anything next. But I'm 22 years old, and for 17 of those years all I've been is a student. So quite a few times this thought has crossed my mind this weekend: Well, now that I'm not a student anymore, what am I? I asked Ma this question today and she said, "You'll be Danielle. You'll be yourself." I guess now it's my opportunity to decide who I want that self to be, and go become that. On that note, it's been real MSU. I can't say that I ever fell in love with you like most alumni claim to, but I can't deny the fact that I've benefited tremendously from choosing State. And I'd like to say that I've transformed as a person too. Goodbye and thank you. Sincerely, a Spartan. Congrats and blessings to errbody!